Dollops of Diane: Lego Girls Know How to Party! When Lego Friends (aka "girl" Legos) came out I know there was some controversy surrounding them. After all, if these were geared towards girls did that mean that girls couldn't play with regular Legos? Did this product just give in to gender role stereotypes? Well we have both "girl" and "boy" Legos here and the kids happily play with all of them. 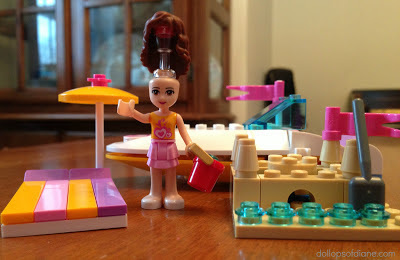 Plus, I personally want to be friends with the Lego Friends girls. After a long day at the beach sometimes the girls get a little crazy and dance around with margaritas smoothies on their heads. Those Lego girls be crazy!